Had far to many friends to list in the SCA, but despite several failed attempts, never really got into it. 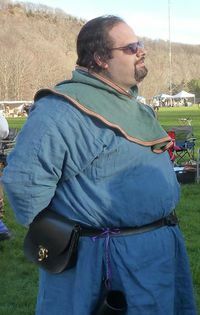 That changed in 2013, when I realized everything I do for fun shuts down for Pennsic. Blacksmith, embroiderer, archer. Donato is a blacksmith and the son of a blacksmith in 1320's Venice working in the expanding Arsenal. Through skill and patronage, he has risen to a position of authority, and the ability to expedite work as needed has expanded his fortunes. Combined with a few shrewd investments in various trading vessels (including those with certain storage areas that tend to be missed by customs inspectors), he has become reasonably wealthy. Not listed in the book of nobility, he will never rise to the ruling class, but instead is content with a comfortable working life, and the free time it gives him to work on personal projects. Happy to do blacksmithing demos if you need them at events within an hour or two of Carolingia. If my presence is required in court, please contact Katla of Viborg or Aryana van Wyck. I do not mind either being surprised or knowing in advance that my presence is required. This page was last edited on 24 February 2018, at 23:37.